Providing bright, secure light, meeting CA Title 24 requirements and saving energy were the city’s main objectives when determining lighting. To help the city meet their sustainability goals, FSC’s LED Radial Wraps were installed, providing a lighting power density well below California Title 24 Energy Code requirements. 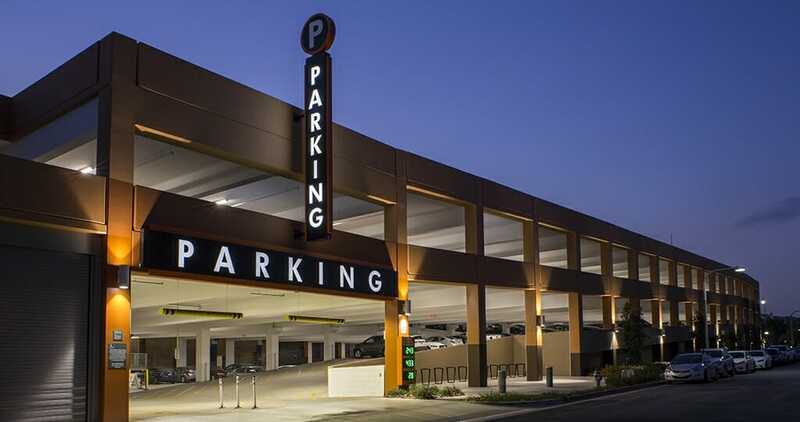 In addition, the L6000 Series fixtures controlled by a sensor helped provide additional savings by reducing energy consumption when the lot is unoccupied. The clean, bright light from these fixtures would provide safety and security throughout. Prefabrication: FSC Lighting made modifications to the fixtures to meet code requirements by punching 3″ holes for access to concrete box opening and additional holes for anchor bolts. This customization made installation faster and simpler for the installing contractor. Energy Consumption: 54 watts per fixture (0.07 watts per square foot), which meets CA Title 24 lighting power density requirements. Light Levels: Meets parking foot candle requirements. Intelligent Lighting Controls: The L6000 Series fixtures are controlled by an integrated high/low passive infrared sensor which helps provide additional savings by reducing energy consumption when the lot is unoccupied.